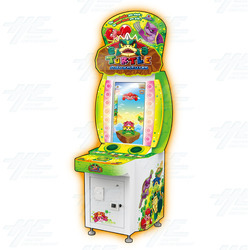 Turtle Adventure Single Arcade Machine is a fun ticket redemption arcade game from IGS which revolves around the concept of stacking funny turtle characters. Players successfully stack the turtles to the top to challenge the UFO Catcher, the more turtles you stack - more turtles you win! To win the grand prize player must collect the same turtles and can win up to 2000 tickets. Turtles Adventure Ticket Redemption Machine has creative gameplay with exciting graphics and sound effects, making it a great game for all ages. This fun and simple game earns well in a variety of locations, including street locations and Family Entertainment Centres, and will draw in kids from all across the floor. Players successfully stack the turtles to the top to challenge the UFO Catcher, the more turtles you stack - more turtles you win! To win the grand prize player must collect the same turtles and can win up to 2000 tickets. Turtles Adventure Ticket Redemption Machine has creative gameplay with exciting graphics and sound effects, making it a great game for all ages. This fun and simple game earns well in a variety of locations, including street locations and Family Entertainment Centres, and will draw in kids from all across the floor.